The neighborhood of Bath Beach is named for the town of Bath, England, home to an impressive complex of Roman baths. The Romans founded the town in the 1st century A.D., and named it Aquae Sulfis – “Hot Springs” – because they found hot springs naturally occurring there. The Romans ascribed medicinal effects to the springs and built baths around them; the complex – with a cooling system and lead-lined pools – was discovered, largely intact, in 1755. Bath Beach itself was once a fashionable resort. The 1862 construction of the Brooklyn, Bath, and Coney Island Line railroad connected the region with Manhattan, prompting its transformation from a farming community into a weekend outpost for New York high society. Throughout the Gilded Age, the shoreline of Bath Beach boasted yacht clubs, villas, and the famous Captain’s Pier Restaurant at the base of 19th Avenue. Also in Bath Beach was the Bath House resort, opened by Doctors Barley, Rogers, Tillery, and Bard in the late 18th century near Gravesend Bay, that was a popular destination for convalescents. In the 1880s, real estate magnate James Lynch bought 350 acres of farmland from the Benson family and incorporated it into his planned suburb of Bensonhurst-by-the-Sea. Present-day Bath Beach encompasses the southern half of this village; the area north of 86th Street lies within the present-day neighborhood of Bensonhurst. Bathing in New York City was slow to catch on. Infrequent – or nonexistent – during colonial times, bathing gained some popularity among the upper classes towards the close of the 18th century. When the Croton Aqueduct opened in 1842, indoor running water made bathing easier (for those who could afford it), but for the masses – particularly the new immigrants crowding into lower Manhattan – facilities were not available. As the volume of immigrants increased, so did national movements to address their living conditions. In 1849, the Association for Improving the Condition of the Poor (AICP) built the People’s Bathing and Washing Establishment at 141 Mott Street, which offered laundry, swimming, and baths for both men and women; but prices were too high for most of the city’s impoverished. The Department of Public Works built its first floating baths in 1870, which operated in the Hudson and East Rivers from June to October, and the AICP built the People’s Bath in the early 1890s, but New York City itself did not begin building public baths until 1895. Despite the popularizing of the germ theory of disease in the 1880s, attendant pressure from reformers, the press, and a campaign led by physician Simon Baruch (1840-1921), the city had maintained that there was no popular support for publicly-funded bathing facilities. In 1895, the state legislature passed a law mandating free bathhouses in municipalities with populations of 50,000 or more, and the first free bath opened on Rivington Street in 1901. By 1914, there were 26 public baths throughout the city. Though most were demolished or converted, a few survive; the indoor pool at the Asser Levy Recreation Center on 23rd and the FDR Drive is an exemplary specimen, with a vaulted, soaring ceiling, a skylight, and a gargoyle. It was renovated for $8 million and reopened in 1990 as a Parks recreation facility. In 1961, the Board of Education (BOE) allocated funds to acquire a site for the future J.H.S. 281 to replace the outdated J.H.S. 128, located at 21st Avenue between 83rd and 84th Streets. In April 1963, BOE requested approval from its Site Selection Board and Mayor Robert F. Wagner (1910-1991) to purchase Block 6891, bounded by 24th Avenue, Bath Avenue, Bay 37th Street, and Cropsey Avenue, for approximately $37,600. The Mayor approved the project that month, and the Site Selection Board gave its approval on July 15, 1963. That same day, the property was acquired by condemnation, and Parks agreed to develop a jointly operated playground on the site that would serve J.H.S. 281 and the surrounding community. The project commenced in 1968, with a total budget of $207,350, and opened on September 30, 1970, on Bath Avenue between 24th Avenue and Bay 37th Street. 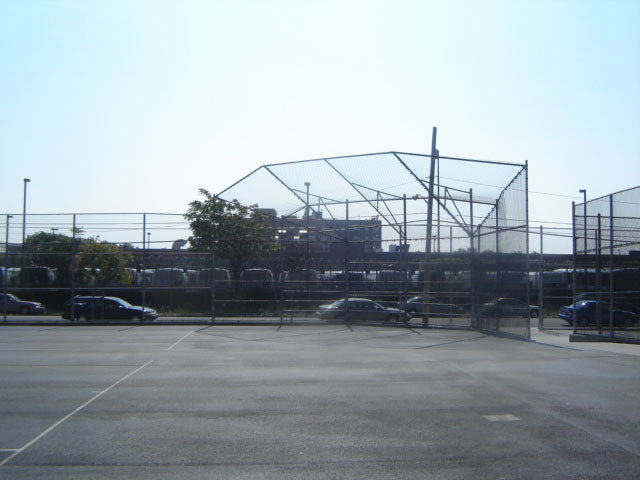 In 1998, 0.0053 of an acre was transferred to BOE for refuse disposal, reducing the acreage of Bath Playground to its present total of 1.157 acres. 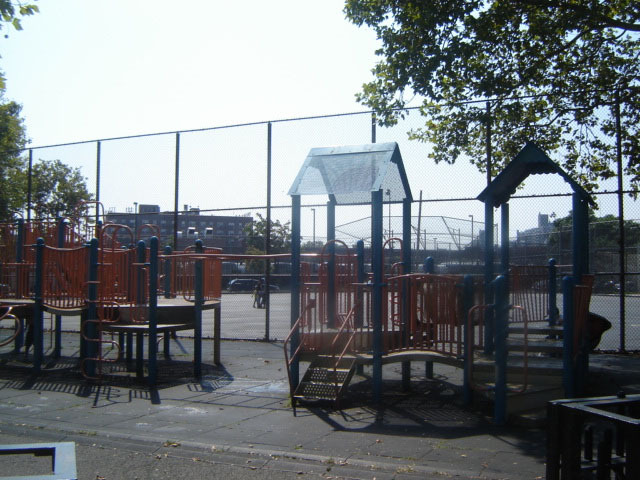 The playground was reconstructed in 1999 for $410,000 provided by Council Member Howard Lasher. Improvements included new play equipment with safety surfacing, a sparrow animal-theme spray shower, water fountains, a compass, and decorative asphalt pavers. 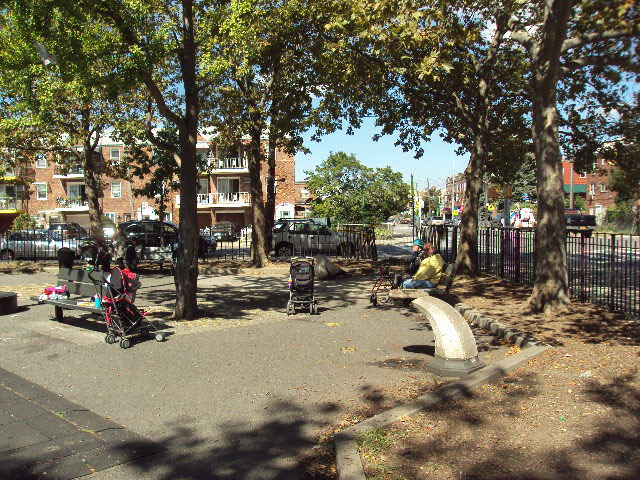 The playground also features baseball diamonds, basketball and handball courts, and gingko (Ginkgo biloba) and London planetrees (Platanus x acerifolia).